Chinese Americans are 10 times more likely to be diagnosed with hepatocellular carcinoma (HCC) than their white counterparts. About 80% of HCC’s among Asian immigrants are associated with hepatitis B virus (HBV) infection. We used data from in-person interviews of Chinese residents in Seattle to examine factors associated with HBV testing. The survey was completed by 206 men and 236 women (cooperation rate: 58%). Less than one-half (48%) of respondents had been tested for HBV. Factors associated (p < 0.01) with ever having tested in bivariate comparisons included knowing that Chinese are more likely to be infected with HBV than Whites; individuals can be infected with HBV for life; HBV infection can cause liver cancer; not believing that HBV can be prevented by having a positive attitude; having a family member, friend, or medical doctor recommend testing; asking for testing from a medical doctor; and not needing interpreter services. In multiple regression analyses, the following factors were independently associated with testing: believing that Chinese were more likely than Whites to get HBV (p = 0.004), having a doctor recommend testing (p ≤ 0.001), asking a doctor for the test (p < 0.001) and not needing an interpreter for doctors visits (p = 0.002). 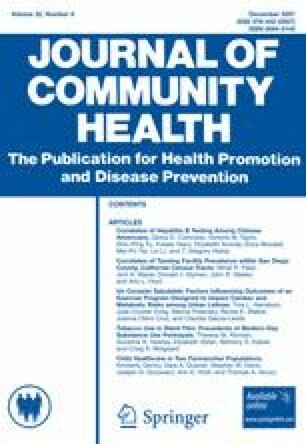 Intervention programs to improve HBV testing rates in Chinese Americans should include strategies to improve knowledge about the risk of HBV and encourage effective communication with health care providers about HBV testing. This work was supported by a Grant 97199 and cooperative agreement 114649 from the National Cancer Institute. Liu, H. (2001). HBV, the silent killer among us. American Chinese Medical Association [http://www.acma.org/journal/content_frame_english.htm]. Focus on Asians and Pacific Islanders, Washington, DC [http://www.hepbinitiative.org]. Asian American/Pacific Islander Profile, Office of Minority Health, Department of Health and Human Services, Washington, DC [http://www.omhrc.gov/templates/browse.aspx?lvl=2&lvlID=53].